Other Products: White Blizzard Nuvo Glitter Drops, Versamark ink, Gansai Tambi Watercolors, Watercolor Cardstock & Koi Waterbrush. 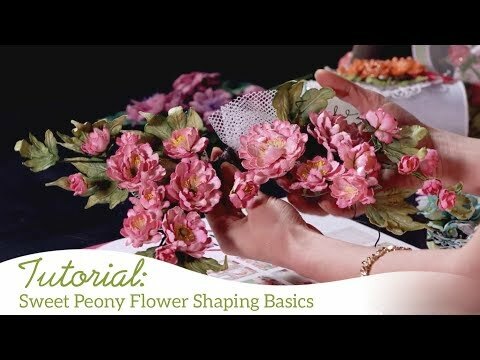 For more tips on creating with the Sweet Peonycollection, watch the tutorial at https://youtu.be/L9_MLkvpGPQ. Instructions: Die cut a piece of white cardstock using the border die from Sweetheart Borders Die and adhere it to the right side of a 4 1/4" x 5 1/2" white cardbase. Stamp the images from Rain Boots and Blossoms Cling Stamp Set and Peony Bud and Blossom Cling Stamp Set on watercolor cardstock using Jet Black Archival Ink and color them using Gansai Tambi Watercolors and Koi Waterbrush. Die cut them using matching dies from Rain Boots and Blossoms Die and Peony Bud and Blossom Die. Add tiny drops of Dandelion Yellow Nuvo Crystal Drops to the hydrangeas flower centers and add drops of White Blizzard Nuvo Glitter Drops to peony flower center. Arrange and adhere them as shown on the card base. Heat emboss the sentiment from Paw-fect Pooches Cling Stamp Set using Versamark ink, White Embossing Powder and Heat It Craft Tool on a piece of black cardstock and trim it as shown. Adhere it to the card front using Darice Adhesive Foam Strips. Make some ladybugs using Ebony Black and Red Berry Nuvo Crystal Drops and glue them to the flower arrangement. Add some drops of White Blizzard Nuvo Glitter Drops around the flower arrangement and some pearls on the border die cut to add finishing touch.